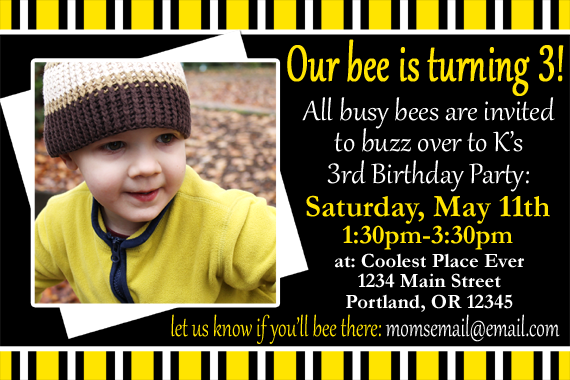 For the bee party invitations, I designed simple yellow, black and white invitations in Photoshop and had them printed at a 4x6 size to hand out to his friends. For his bee party, K wore a bee shirt we made for the occasion. It actually didn't have wings yet (those came later to turn it into a Halloween costume) but it was super fun to wear. 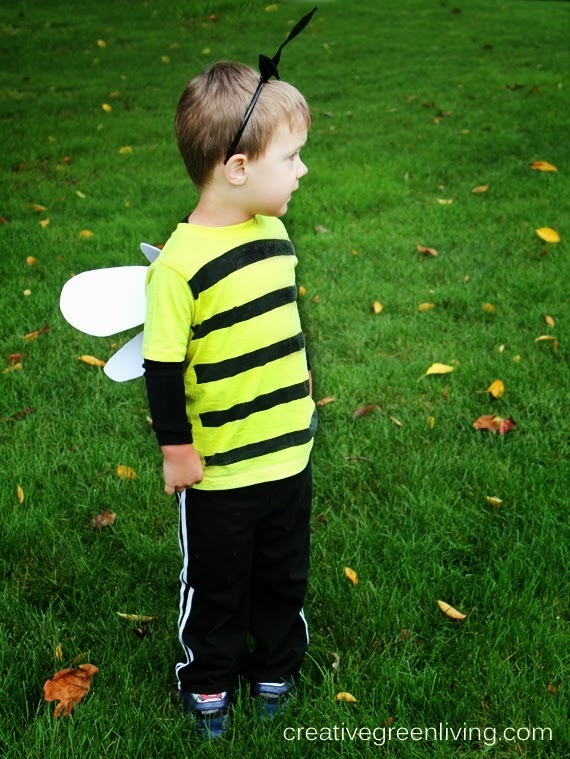 See how to make the bee shirt / costume here. We also had bee headbands for his friends to wear. 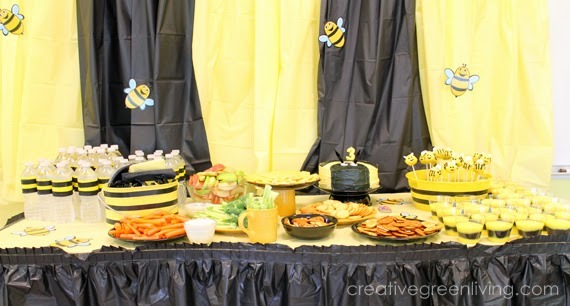 To decorate the food table, we hung up yellow and black tablecloths vertically against the wall as well as covered the table in a yellow table cloth with a black table skirt. 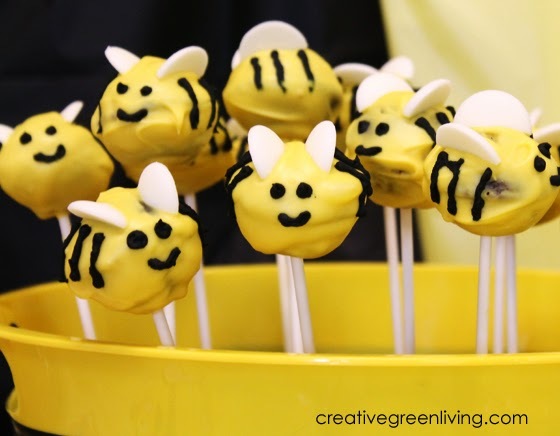 Making these bee cake pops was an adventure to say the least!! See my post about the Bee Pops here. My son also insisted on having a regular bee cake to go along with the cake pops. A cake with a similar design that we saw on display at Jo-Ann Fabric & Crafts is really what inspired the whole party. 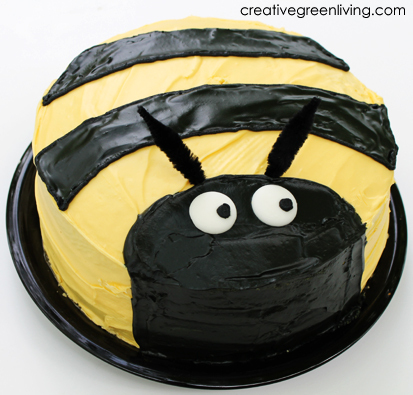 Learn how to make a bee cake here - it's really easy! 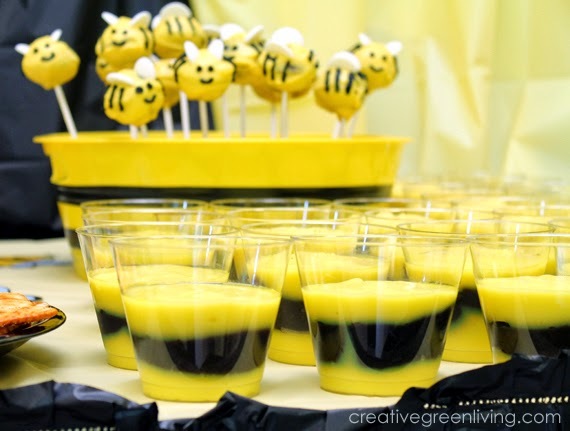 For a snack, we had striped bee pudding. To make it, I just layered vanilla pudding (dyed yellow) and chocolate pudding (dyed black) in clear cups from the dollar store. 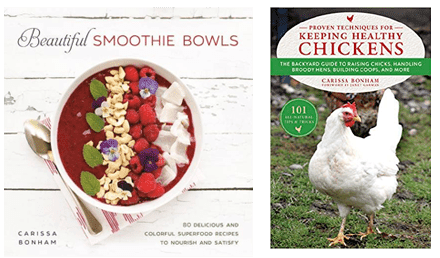 For a healthier twist on the same idea, you could use yogurt instead of pudding. 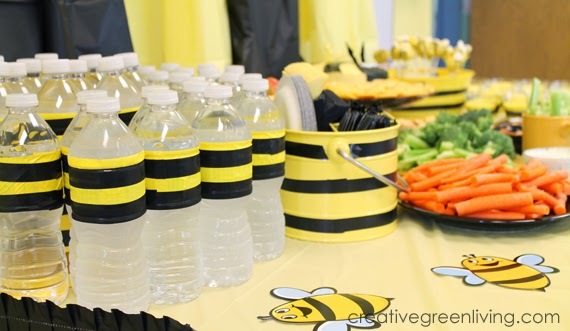 We wrapped water bottles with yellow duck tape and added black stripes using electric tape to fit the bee theme. We also served an assortment of fresh veggies, crackers, cheese, apple slices and dip on black and yellow plates. We also added black stripes to a yellow silverware holder using electric tape. I purchased Jointed Paper Bees as well as assorted pom poms, chenille stems and googley eyes. I found the little yellow tubs to hold the supplies at Dollar Tree. I had a glue gun available for big kids (and for adults to help with) as well as white glue. In retrospect, I would have just gone with a couple bottles of Aleene's Fast Grab Tacky Glue and skipped hot glue all together so an adult didn't need to babysit it. 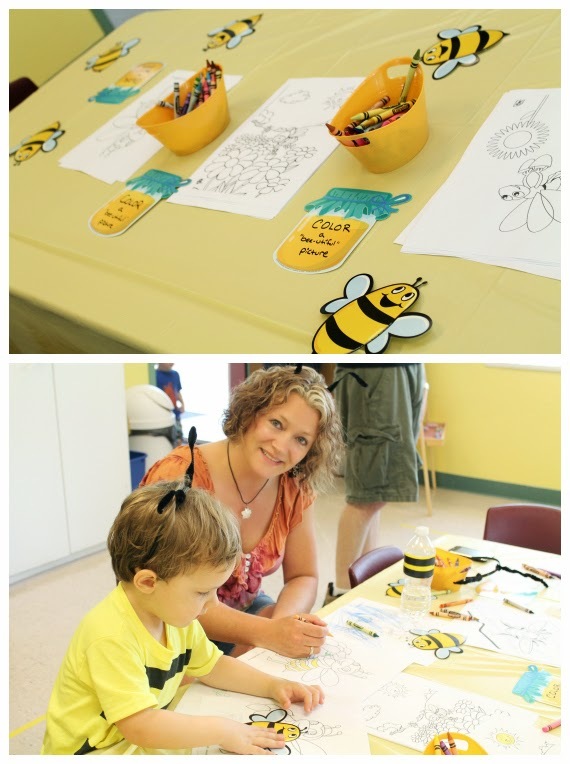 For the bee themed coloring station, I printed off a variety of bee coloring pages and set them out with tubs of crayons so kids could color their own bees. Just Google "bee coloring pages" for lots of great options. For the bee hunt, we made a small army of bees from leftover Easter eggs (you can also just order bags of Yellow Easter Eggs here). 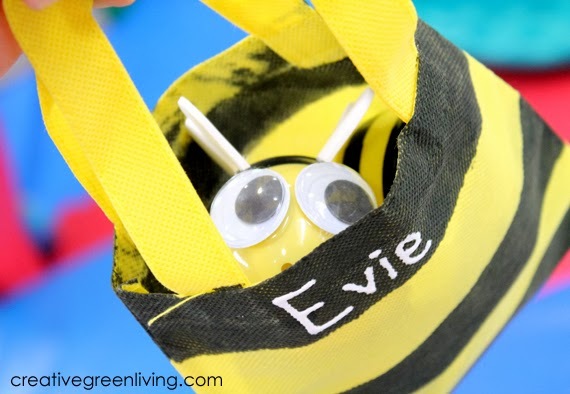 Each of the kids got a personalized bee bag to collect their bees in as well as take home their other party favors. 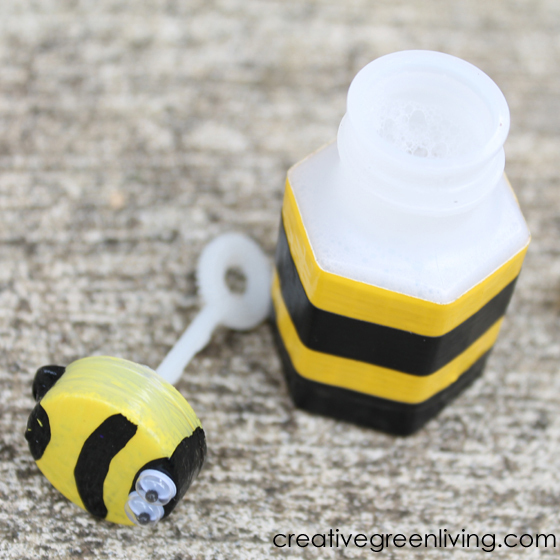 See how to make Bee Hunt bees here. See how to make striped party favor bags here. Everyone got to take home a personalized (reusable) bee favor bag. We were also able to use the bee bags on the bee hunt. 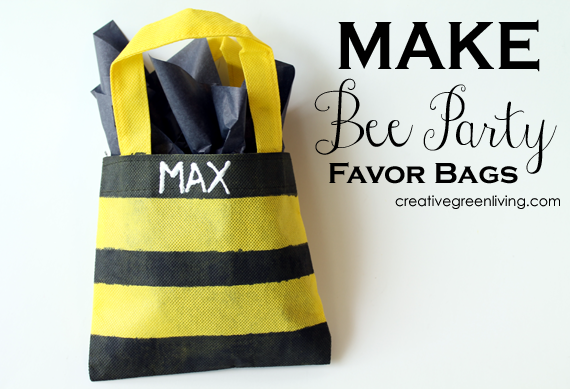 See how to make reusable bee favor bags here. 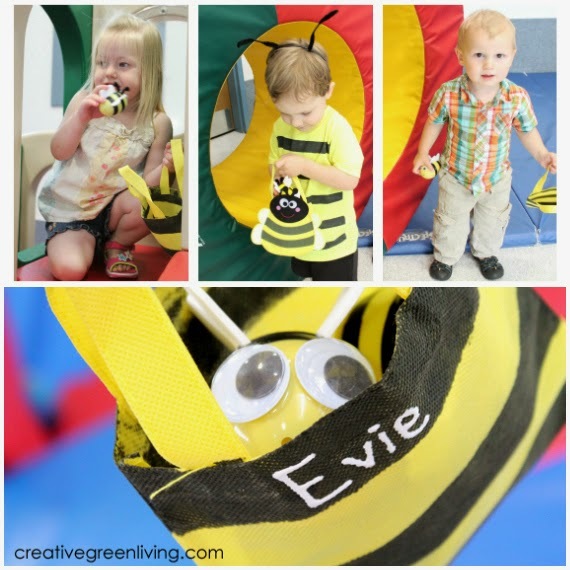 Each child got to "adopt a bubble bee" to put in his or her bag. 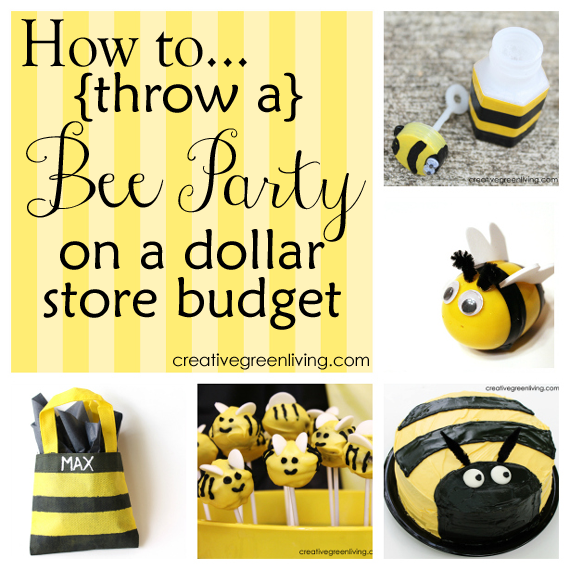 See how to make "bubble bee" party favors here. 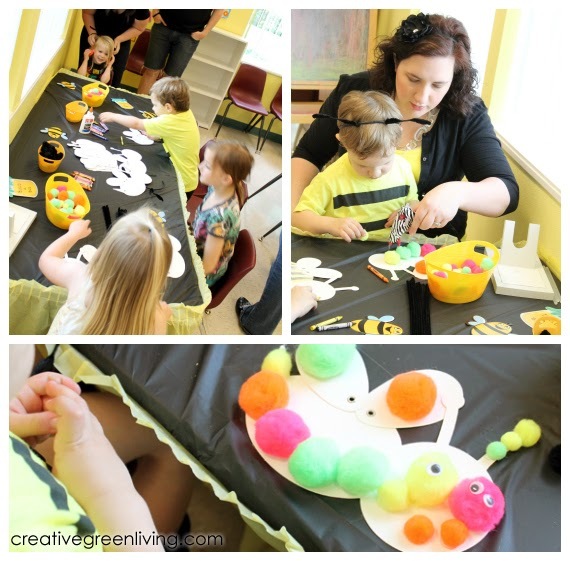 Learn how to make bee hunt bees here. Did you like this post? Click here to pin it! 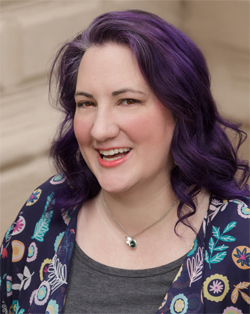 I won't lie, though: it was a ton of work up front! Huge props again to Niina for humoring me and my crazy bee party vision. She literally spent hours with me making bee hunt bees and bee pops and the bee cake and....the list goes on. I get worn out just thinking about all the stuff we did! None of it was hard - just time consuming. 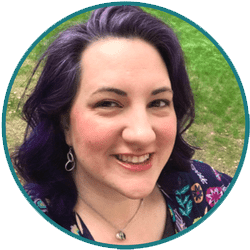 Be sure to start working on your party projects a few weeks ahead of time to avoid a crazy last minute scramble.